Back in November, Heather and I took a class with the fabric designer/printmaker/quilter/all-around-crafty-lady Lizzy House. 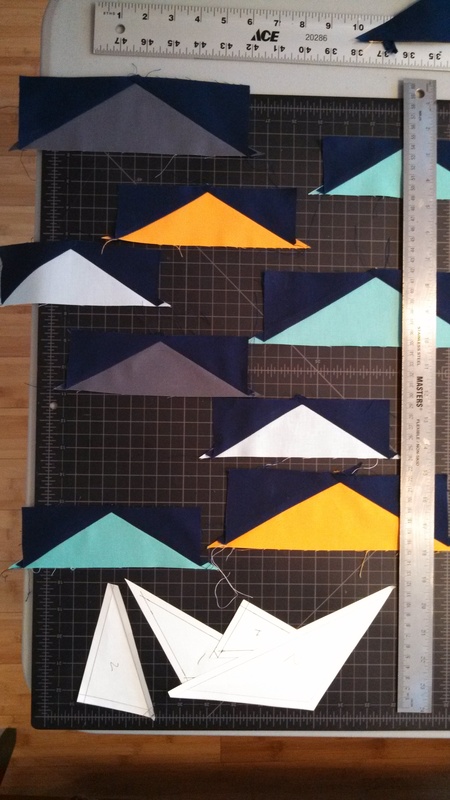 As part of my quest to know how to make anything out of anything, we have been taking a number of sewing classes at gather here, a fabric and fiber store in Cambridge. It is the kind of place where there are always a few people just sitting on the couch knitting, snacks waiting for you when you come in, and lots of amazing things to look at and think about buying. I have so far taken three classes with Virginia, the owner, who really knows what she is doing. We stay up late the night classes are posted, so we can pick something we really want to take before they all fill up. If you take the last spot in one we want, we will have to stop being friends. 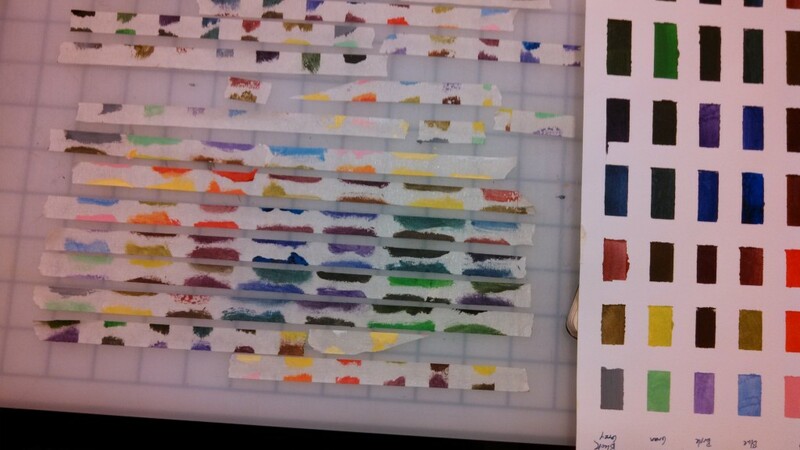 This class was on color theory and mini quilts, two things I know very little about. I tend to make what feel like obvious and readily-apparent color choices, avoiding fine differentiation whenever possible. Add to this tendency my issues with situationally-dependent color confusion (known to most of you as color blindness, a gross overstatement of fact) and some degree of indecisiveness. The wall of paint chips at the hardware store is completely overwhelming. So I had to be brave with this class and step out of my comfort zone in a big way. Little did I know, but Lizzie House is a very critical teacher. Within five minutes of class starting, I found myself out in the hall, writing “I will not make poor color choices. I will not make poor color choices.” I was not allowed to have a gold star at the end, and Heather was so ashamed that she pretended not to know me. Oh wait, that’s not how it happened. 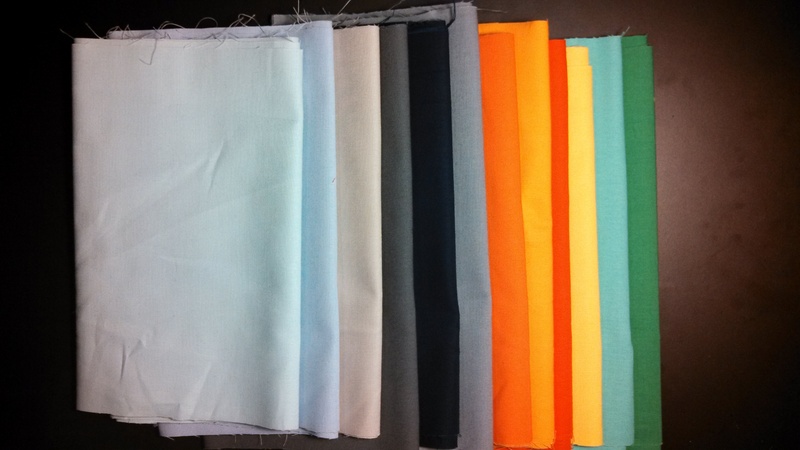 Fabric colors before the workshop. After playing with color temperature, one of my classmates named Becca took off her tape in a very artistic way! 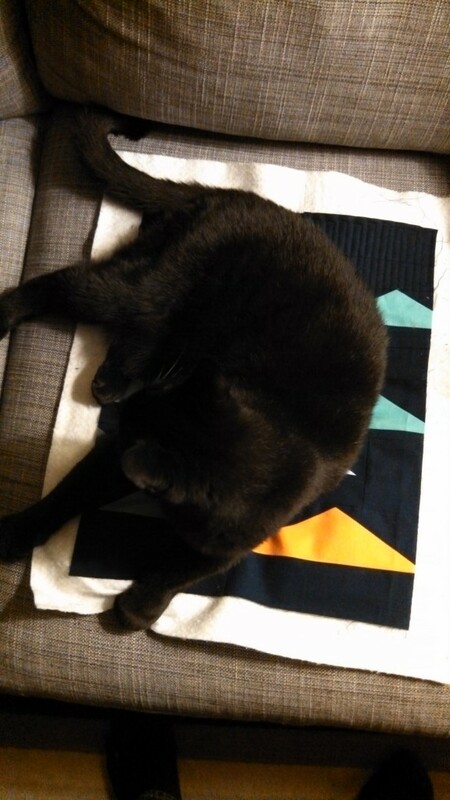 Figuring out the quilt. 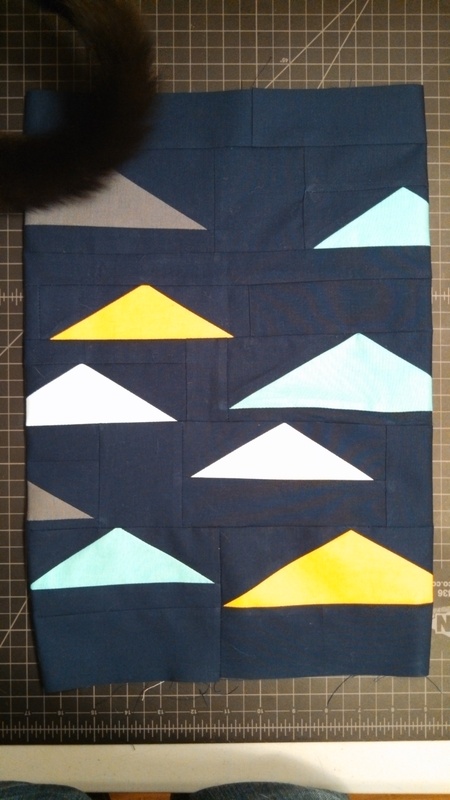 I have never quilted before, so it was fun to mess around and teach myself how such a thing is done. 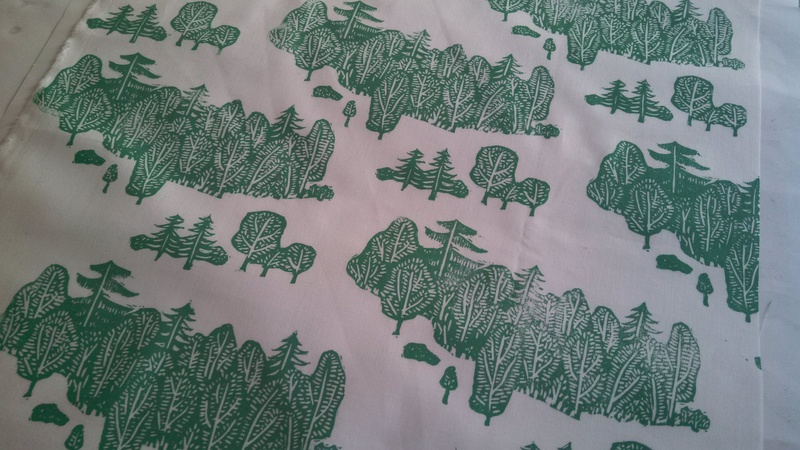 For the back of the quilt, I designed and block printed a fabric with this forest. One of the biggest takeaways I had from this class was a renewed interest in making art. Before it even happened, I took out my sketchbook and played with ideas. I made sketches, I doodled little cartoons, I did some meditative mark-making. After spending so much time back in college making and thinking about art, this kind of creative thinking and work has been an unfilled hole in my life, and it was so wonderful to have a project to jump into once again. 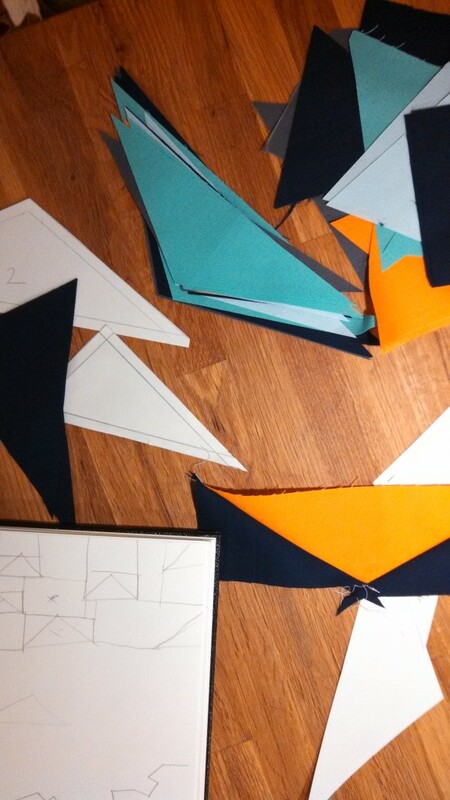 And so, with encouragement from Lizzy, Heather and I are going to try designing a line of fabric together. We are going to make some prints, make some drawings, play around in Illustrator, and get back to doing something we love. Thank you, Lizzy. 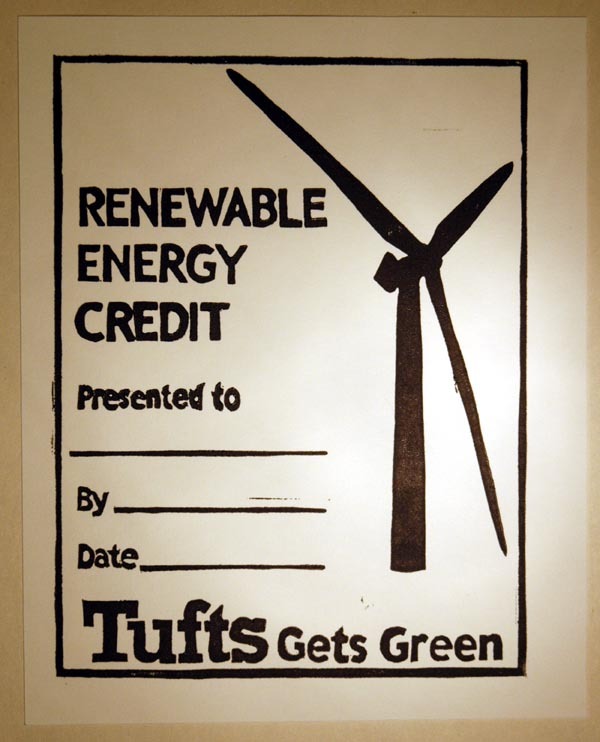 Lately, I have been doing part-time temp work at the Tufts Institute of the Environment. It has been fun and has given me a small but steady source of income while I wait to get hired somewhere full time. I’ve been able to do creative things, building them some furniture, designing and updating several websites, making signs for upcoming lectures and events, and doing general office work. 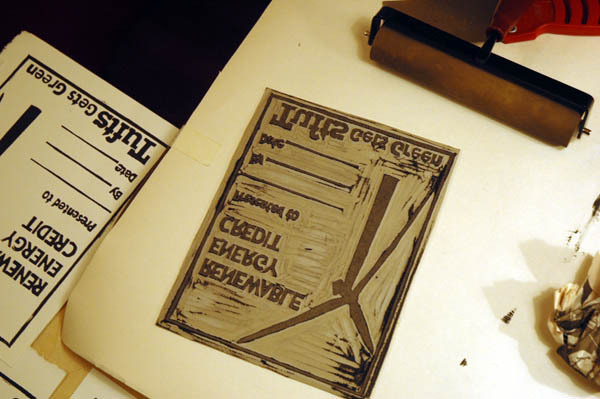 Today, I was making some block print cards for renewable energy credits. They want to give these out as gifts for speakers, as an environmentally-conscious alternative. For me, it was just a great chance to pull out all of my printmaking equipment and go at it. It has been a while since I have made any prints, and doing it tonight reminded me why. 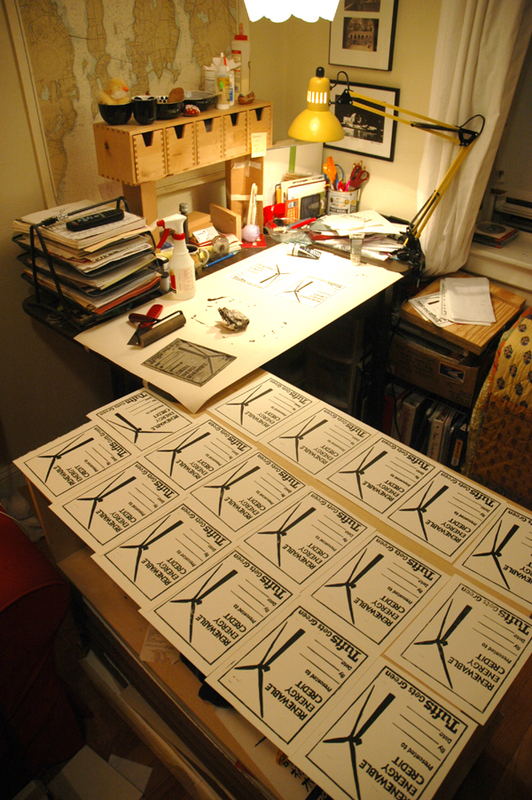 From start to finish, the process took seven hours: designing on the computer, transferring the design to the linoleum, cutting it out, setting up for printing, cutting the paper, inking up the block, and making the prints. All of my stuff has exploded over the living room, but I’ll put it all back tomorrow. And it all turned out well in the end. The letters got a little ink-filled by the end, but I now have 22 nice prints. It is nice to get paid to do this, even though I love doing it on its own. Tomorrow, they are giving one to Erin Brockovich, who is giving a talk at Tufts. I feel famous by association.